When will be Beyhadh next episode air date? Is Beyhadh renewed or cancelled? Where to countdown Beyhadh air dates? Is Beyhadh worth watching? Beyhadh chronicles the lives of Maya, Arjun, and Saanjh, and how their paths cross as one of them decides to rewrite their destinies. A young business tycoon, Maya has always steered clear from relationships and is extremely guarded about her life. However, things change when she meets Arjun, a carefree and happy-go lucky aspiring photographer. Maya falls head over heels in love with him. On the other hand, Arjun's childhood best friend, Saanjh, a beautiful, loving and righteous girl, only wishes for his happiness and is the guiding light of his life. She secretly loves Arjun but has never confessed her feelings to him. What happens when Maya's love becomes so unrestrained that it crosses all boundaries of rationality? 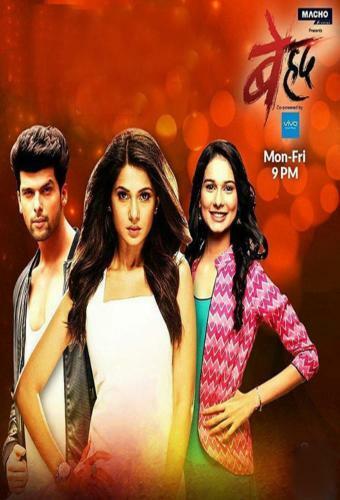 Beyhadh next episode air date provides TVMaze for you. EpisoDate.com is your TV show guide to Countdown Beyhadh Episode Air Dates and to stay in touch with Beyhadh next episode Air Date and your others favorite TV Shows. Add the shows you like to a "Watchlist" and let the site take it from there.